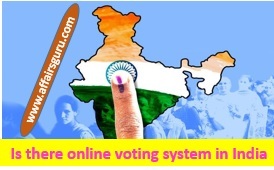 Why Online Voting System is not allowed in India? OR Is there online voting system in India? Internet and Smartphones usage in India has massively increased now a days. Still there is no way to do online voting in India. India is using the Electronic Voting Machine (EVM) since 1999 to conduct the Lok Sabha and Assemby election. According to Indian Constitution 236 Article, Person whose age is 18 years or more is eligible to cast their vote and choose their leader. 1 Why is no online voting System available in India? 4 What Countries have Online Voting? 6 Can we vote by post in India? Indian citizens have to visit to the designated voting poll booth to cast their vote. According to ECI, VVPAT EVM is more secure and transparent system of conducing vote. Any corruption or modification is not possible in EVM. Why is no online voting System available in India? Following are the reasons to have not access to online voting system in India. Low Internet Access Users in India. Hacking in Online System is possible. If found any error in system, there is no way to count the vote. Various parties leaders force to people to vote them at the time of cast vote. High Server traffic can slow down system. In India, following are the 3 types of voters. An Indian citizen who is 18 year old and above. Non-Resident Indians(NRI) living in abroad for education or work. An individuals who have following any of service qualification. Person employed under the GOI (Government of India) but servicing outside of India. Member of Armed Forces, Assam Rifles, BSF, CRPF, ITBF and GREF in Border Road Organisation. Member of an Armed Police of a State and serving outside of state. Servicing Voter can use the postal ballot services or proxy votes. ECI had filed a complaint with Delhi Police (DP) to track the persons spreading the fake news. Fake news is that NRIs can cast their vote online in Lok Sabha 2019. Fake post were also uploaded on the giant Social media like FB, Twitter, WhatsApp. E.g. A person who has passport can vote online in 2019. ECI has again reiterated that there is no online voting facility in India. Overseas Voters have also need to visit designated Polling booth with their passport. What Countries have Online Voting? Several nation have tried to use online voting – Australia, Canada, Estonia, Finland, France and Norway. Can we vote by post in India? Only Service Electors are allowed to vote through Postal ballot. Voting Time for the election is mostly from 7 AM to 6 PM. 1st Step : Visit to the official website of NSVP. 2nd Step : Click on ‘Search Your Name in Electoral Roll’. given in left side of page. 3rd Step : Enter your required information. 5th Step : Now your polling station will appear below in bottom.